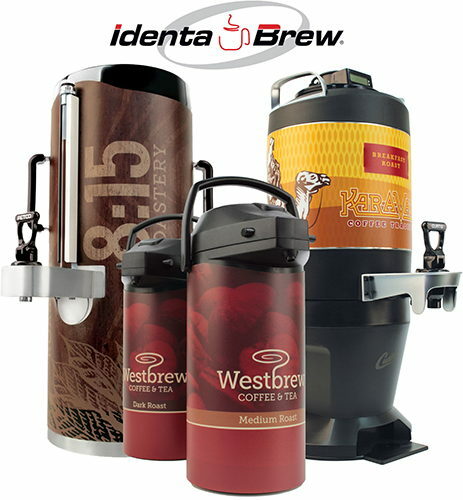 Since 1997 IdentaBrew® has remained a leading resource for all levels of beverage merchandising and brand exposure. 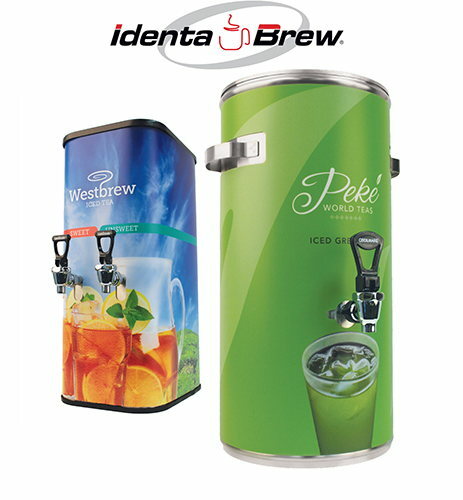 IdentaBrew’s spectrum of services includes coffee and tea airpot covers and labels, dispenser branding, urn wraps, brewer and machine graphics, in addition to a wide array of popular beverage dispenser equipment. 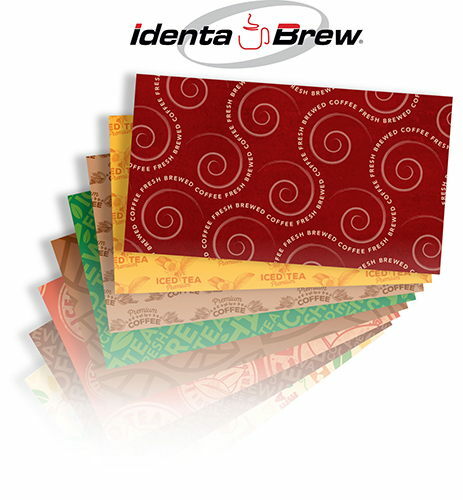 IdentaBrew products are durable, washable, and stain resistant to withstand demanding food service environments. Our extended capabilities include design, prepress, printing, die cutting, custom finishing, and fulfillment. 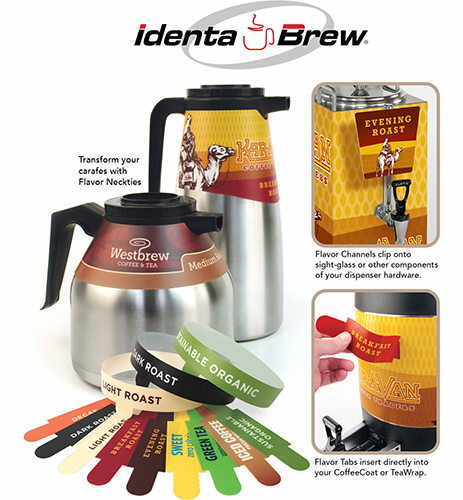 IdentaBrew CoffeeCoats are the tried-and-true industry standard wrap solution for your beverage brand. From independent brands to hospitality chains, we’ve got your hardware covered. Every IdentaBrew® TeaWrap is engineered to fit your manufacturer’s dispensers like a glove, with the same industry-standard properties as our popular CoffeeCoats for airpots and thermal servers. All IdentaBrew® products support our unique flavor identification systems. Neckties effectively promote your brand while being served. Flavor Channels are engineered specifically for your equipment, offering unique opportunities to present your brand’s featured flavor or roast. Flavor Tabs are consistently located with diecut slits incorporated in your Coffee Coat or Tea Wrap. For branding programs that require a head-to-toe solution, ldentaBrew® has developed after-market solutions for many of today's most popular equipment. Merchandising kits can incorporate nearly any surface: front and side panels, backsplashes, switch plates, brew funnels, grinders and hoppers. 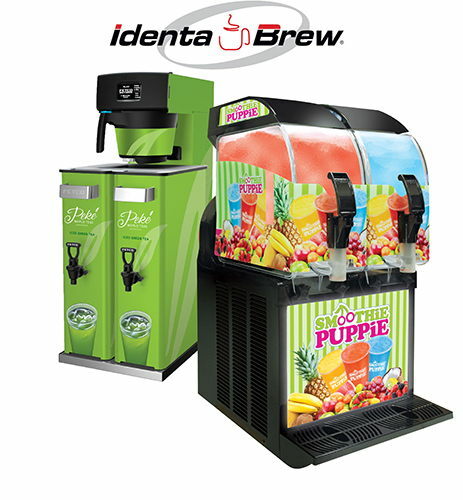 For the growing demand in cold specialty drinks, ldentaBrew has engineered merchandising packages to fit most frozen beverage equipment in the market today. With over 18 designs to choose from, our generic wraps offer the most cost-effective solution to dress up your equipment. 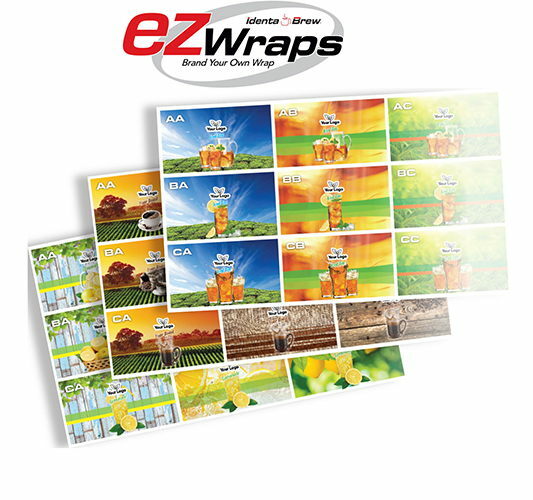 EZ Wraps are the answer when you need a co-branded wrap without the added expense of design services. Simply supply your logo, mix and match from our coffee, tea, or lemonade product styles, and we’ll do the rest. Contact us below to get started. Contact us today with your marketing, branding and merchandising needs.